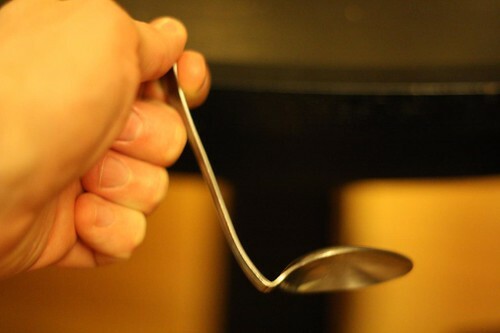 What I crafted was this: a bent spoon. With this I would be able to dip lower into the glass and catch the Guinness closer to the point of impact. In my research I discovered an intense and angry debate on which beer was the best to pair with the Guinness: Harp or Bass. I don't really care for either of these beers and in order to piss both sides of I chose to use Smithwick's. The result, after all of this research and creation of special instruments was . . .
. . . a disaster. Well, I've got four more nights this week to have some more tries at it. 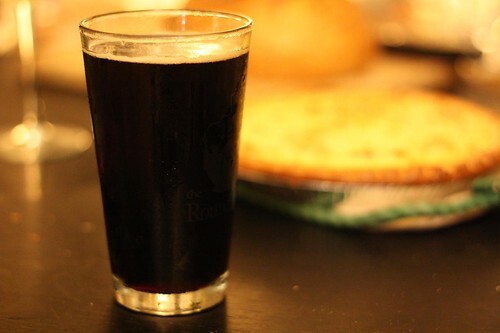 Part of it, I realized, was that I was using the Guinness Extra Stout so I'm going to attempt it again with the Guinness Draught and see if I can achieve better results. I certainly can't achieve results any poorer. The actual preparation of dinner tonight literally took fewer than five minutes. I purchased a frozen pie shell on my way home, got home, threw all the leftovers from our weekend get together into the pie shell, tossed it into the oven, then left to go pick Jen up from the train station. When I got back I turned the oven back on and finished it. In the pie was the chopped up remaining corned beef, bangers, potato, cabbage, onion, and carrots. 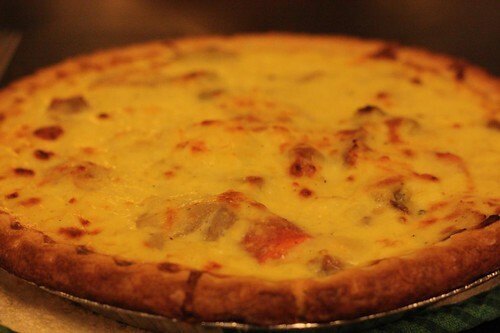 Then I poured with the remaining potato-egg-cream mixture from the asparagus tart and topped it with some shredded Irish cheddar. I had intended to do this in filo dough but I only had give minutes and this was the best I could manage. On the side I tossed some mixed greens with lemon, olive oil, and the remaining Cashel blue cheese. It ended up coming out really well. It was kind of an odd dinner but given the time allotment it was passable. This was one of the few nights where it's taken longer to write the blog entry than to cook dinner! 30 minute meals? Pfft! I've got 5 minute meals and that's without a crew of minions doing all my grunt work. Take that, Rachael Ray!